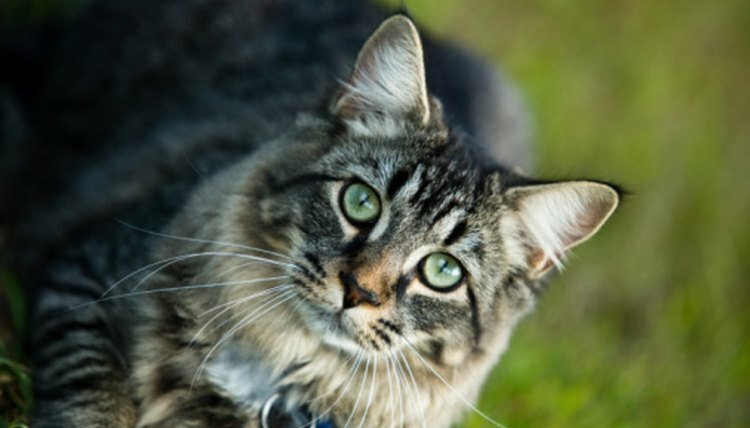 A cat’s hair gets matted if she is not groomed on a regular basis. This is especially true for long-haired cats such as Persians and Himalayans. According to the ASPCA, matted hair can be painful for the cat and cause skin problems. As a cat gets older it is important to keep the cat as healthy as possible. This means grooming it a few times (or more) a week to keep its coat smooth and tangled free. Also, regular grooming removes loose hair and ultimately eliminates furballs which can be more annoying for older cats. Groom the old cat after he has eaten. He is more relaxed at this point and more receptive to grooming. Be relaxed and calm so the cat will be also. Try to make grooming fun for the cat, but with older cats the idea is to reduce stress as much as possible. Brush the cat with a rubber brush. Brush in the direction of the hair. This method is good for loosening dirt, hair and tangles. Add a tiny bit of cornstarch to a mat. Work it down into the mat with the fingers. Use a wide tooth metal comb to remove the mat. Start at the ends of the hair and move inwards. Comb gently so as not to hurt the cat. Repeat process with each mat. This technique removes small mats. Use a pet hair rake to remove larger mats. This tool resembles a tiny rake. Pull the hair in one direction to detangle the mat. Do this repeatedly until the mat is gone. The rake has long teeth that dig down into the mat. Be careful that the rake’s teeth are not scraping against the cat’s skin. Use a seam ripper for large difficult mats. Cut from side to side (horizontally) to slice or section the mat. Once the mat is separated, use the comb to untangle the hair in each section. Start at the top and work downwards to the skin. .
Use electric clippers to shave away the mat. This is best for large mats that don’t respond to the rake or the seam ripper.. Be very careful with cutting away the mat so as not to cut the cat's skin. If nervous about doing this, consider taking cat to pet groomer. Don't try to remove all mats in one session even if the cat is not agitated. Spread out the groomming. Giving the cat a treat may also help in keeping the cat calm. Grrooming the cat daily is the best way to avoid mats. See a pet groomer for extensive mats. These professional offer the best solution for removing large and stubborn mats. Take the cat to a vet is you notice skin rashes or lesions under the mat. Severe mats can cause skin problems. When a cat becomes very agitated during the grooming, stop for awhile. If needed, wait until the next day.